Fred Williams was born and trained in Melbourne, at the National Gallery School and the George Bell Art School during the 1940s. At the end of 1951 he left for London and further study, returning to Australia in 1957. During these formative years he focused on depictions of the figure in his art. However, when he returned to Melbourne he redirected his attention to the Australian environment, exploring this subject as a platform for formal invention in his practice. With this as his creative directive, Williams embarked on a seminal series of paintings in the 1960s that changed the way many people viewed the Australian landscape. Williams first visited the You Yangs – the landscape of granite ridges situated between Melbourne and Geelong in Victoria – in the winter of 1962. Working in situ, he began painting his observations in watercolour, developing these studies in his studio into a series of radically abstracted paintings. ‘You Yangs landscape’ 1963 is one of his great achievements in this group of works. It exemplifies Williams’s distinct vision of the landscape that combines a feel for its expanse with suggestions of its nuanced forms. ‘You Yangs landscape’ demonstrates how Williams negated the horizon line in his work (which, historically, had been key to Western landscape painting) and offered instead a more spatially ambiguous ordering of the countryside. The picture plane is tilted and imaged as an unstructured space, where gestural abstract markings and dotted areas of intricate paint work are used to invoke the landscape’s scattering of trees, rocks and fencing in abbreviated form. In the traditions of 20th century Australian landscape painting, Williams positioned himself as ‘a link between Nolan and Drysdale: Nolan the irrational, Drysdale the formal’.1 He had derived his model of abstraction from studying the structural order of cubist painting as well as the work of Paul Cézanne. 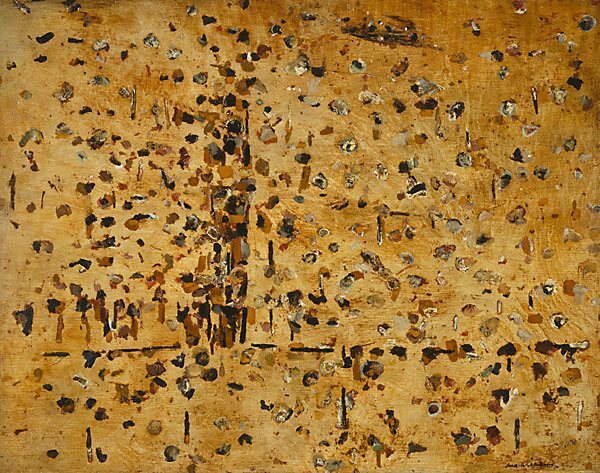 Yet as ‘You Yangs landscape’ demonstrates, Williams used this formal approach to imply the experience of place; where his aesthetic of dots and dashes act like memory’s truncated visual mapping of landscapes and evokes a sense of being immersed in its forms. This work was exhibited in the 1963 Wynne Prize. Signed l.r. corner, black oil "Fred Williams". Not dated.